Similar to other institutions with a great history in Romania, the I.L Caragiale National Theater (TNB) went through many difficult challenges over time, especially during the great historical events that marked the last century. 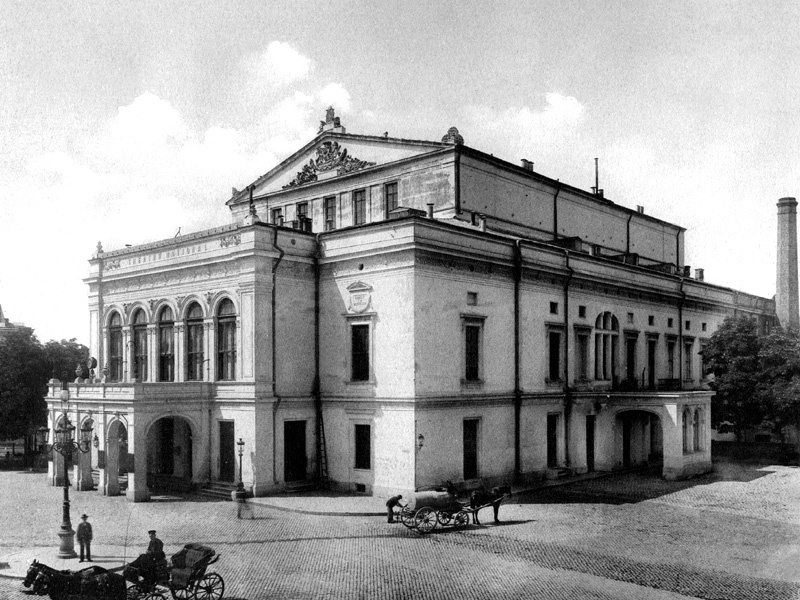 The National Theater institution was born in a building that no longer exists. The current imposing building of the theater, recently renovated, is located in the Universităţii Square in Bucharest. The story of the National Theater begins more than 180 years ago, in 1836, when the Philharmonic Society, an important cultural society founded on the initiative of Ion Heliade Rădulescu and Ion Câmpineanu, bought an inn located next to today’s Calea Victoriei – which was then called Braşovului Road - to build the National Theater. Prince Alexandru Ghica approved the project four years later. Five more years have passed until the design of the Viennese architect Heft was chosen for the new construction. The Grand Theater (Teatrul cel Mare) was inaugurated in late 1852. Costache Caragiale was the first director of the theater. He was the uncle of famous Romanian playwright Ion Luca Caragiale, whose name was given to the National Theater a century after the inauguration. A year after the opening, Matei Millo, a famous actor and dramatic Romanian playwright, staged for the first time in Bucharest the play „Chirița în provincie” by Vasile Alecsandri, an important Romanian poet and playwright. Two years later, Prime Minister Mihail Kogalniceanu signed a decree by which the Grand Theater became a national institution. Thus, in 1875, director Alexandru Odobescu, another important national writer, added on the frontispiece the new name of the institution: the National Theater. During the War of Independence (1877-1778), the theater organized several performances and the money raised was used to treat wounded soldiers and help keep the hospitals working. During World War I, the National Theater Company took refuge in Iaşi, in Northern Romania. The National Theater continued to be a landmark of the cultural life in Bucharest after the Great Union of 1918. Countless plays by great Romanian playwrights premiered on its stage. In 1919, the year after the Great Union, the Theater organized the first national tour throughout Great Romania, reaching Transylvania and Banat with the play “Apus de soare/Sunset” by Barbu Ştefănescu Delavrancea and “Răzvan & Vidra” by Bogdan Petriceicu Hașdeu, both important historical dramas of the Romanian literature. The Baroque theater building on Calea Victoriei continued its cultural mission and resisted until 1944. Close to the end of World War II, in August 1944, the theater was bombed by the German aviation during a mission that was in fact aimed at destroying the Telephony Palace (“Palatul Telefoanelor”), a neighboring building. In the 2000s, a hotel was built on the site of the old National Theater building. The hotel still exists today on Calea Victoriei – its facade reproduces faithfully the exterior of the old National Theater. After the bombing that destroyed the building on Calea Victoriei, the theater continued its activity in the halls named Comedia (Majestic), Studio in Amzei Square, festivity halls of high schools Sfântul Sava and Matei Basarab, and the Military Circle (“Cercul Militar”) building. After a while, Comedia and Studio were the only two halls still available for theater plays. In 1952, the year that marked the centenary of the National Theater, the institution was named after the great Romanian playwright Ion Luca Caragiale. The new building of the I.L. Caragiale National Theater was inaugurated in December 1973 in the central area of the Universităţii Square. Back then, the theater had three halls: the Great Hall, the Small Hall and the Atelier Hall. The architecture of the building belonged to the modernism of the ‘60s, the original project (1964-1973) being signed by the architects Horia Maicu, Romeo Belea and Nicolae Cuc. The hat-shaped form, which became a symbol of the building, seems to have been the reason why the former communist dictator Nicolae Ceauşescu demanded in 1978, after a fire that destroyed the Great Hall, the remodeling of the building, both on the inside and on the outside. The reason is said to have been that this form didn’t look like a “house” in a classical way, but rather like a hat. A new hall appeared following these changes: the Amfiteatru Hall. The National Theater in Bucharest, an iconic building for the Romanian culture, was once again revamped and consolidated starting 2011 (opening picture). Following these works, TNB’s façade returned to its original form – the one before the remodeling works of the communist era - and the number of halls increased to seven, including an open-air hall. Furthermore, the Great Hall regained its original form, with the official lodge ordered by Nicolae Ceauşescu being removed from the plan. The new National Theater was inaugurated in November 2014 and the first show was staged a few months later in April 2015. The National Theater has been and will remain a true cultural symbol of national importance, a cultural institution that has helped form many generations of actors for more than 100 years. The I.L. Caragiale National Theater is located in the center of Bucharest, at the intersection of boulevards Nicolae Bălcescu, I.C.Brătianu, Regina Elisabeta and Carol I, at 2, Nicolae Bălcescu Blvd. The nearest subway station is Universităţii Square, and the buses that have nearby stations are 137. 336. 601. 381. The express bus 783 also stops in Universităţii Square.